Trump Administration Will Miss Deadline To Reunite Migrant Kids Under 5 With Parents Of the 102 young children in custody, the Justice Department says at least 54 will return to their parents by Tuesday as ordered by a court. But a judge still voiced optimism about "real progress." 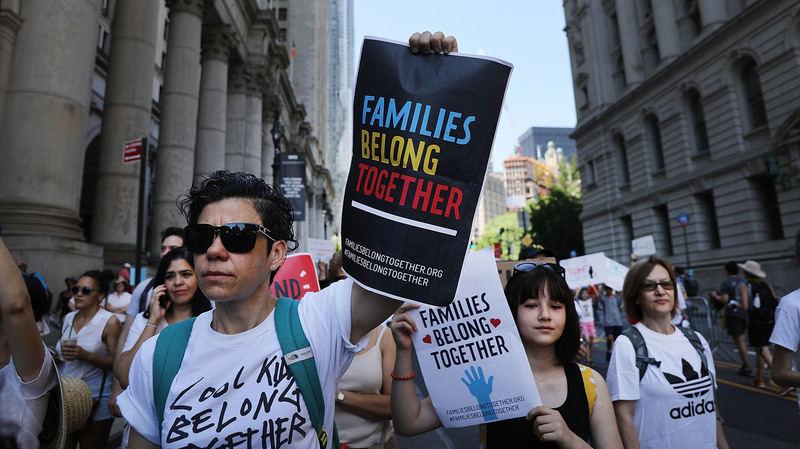 Protesters in New York City marched last month in support of the families separated at U.S.-Mexico border. Of the nearly 3,000 migrant minors who were separated from their parents and placed in federal custody, the Trump administration says at least 102 are under 5 years old. And for several weeks, administration officials have been under a court-ordered deadline: Reunite those young children with their parents, and do it quickly. Now, one day before a Tuesday deadline, the administration says authorities expect to return just over half of the kids — but that they will need more time to figure out the rest. On Monday, Justice Department attorney Sarah Fabian told a federal court in San Diego that at least 54 children — and as many as 59 — will be reunited with their families in the custody of Immigration and Customs Enforcement. In recent days, at least two children under 5 years old have been returned to their families. But reuniting the remainder has proved to be a much tougher task for Justice and immigration officials, who for months separated migrant families at the U.S-Mexico border under the Trump administration's "zero-tolerance" policy. Trump ended the practice with an executive order last month, but federal officials have struggled since then with how, exactly, to undo its results. Fabian attributed the holdup to difficulties tracking down some parents, and to necessary background checks on those whom they've found. Several parents have already been deported, while authorities disqualified others due to criminal records. As NPR's John Burnett explained Friday, the Department of Health and Human Services says it has hired 250 additional personnel in the sprint to comply with the court order. "They're working nights and weekends to comply with the judge's orders. But they say they have to do cheek swabs of the children and the parents to do DNA tests to establish parentage. They have to conduct criminal background checks of the parents. They have to determine the fitness of the parents to be able to release the kids to them," John noted. "And so the government says the tension is between a fast release and a safe release." Despite these efforts, there's a chance the government's list of young children awaiting reunion may actually grow before authorities can reduce it further. Attorneys for the American Civil Liberties Union, which brought the lawsuit, said activists have turned up as many as 10 more names that need to added to the number of separated kids still in detention. That discrepancy in numbers is one of several disagreements both sides of the suit, the Justice Department and the ACLU, pledged to discuss later Monday. In the courtroom, they expressed openness to collaborating on several issues, including searching for parents who have been removed from the U.S. and double-checking the criminal records. Among the other remaining question marks is whether authorities can streamline their vetting process for the migrant parents — which ACLU attorneys have described as needlessly cumbersome — and whether the government can pass along the locations migrant families will be released from custody, so that charity groups can more quickly offer them support. As daunting as the process appeared in court, this week's deadline concerns less than 5 percent of the children separated from their parents in recent months. Under Sabraw's order last month, the rest of the minors will need to be returned to their families by July 26. In the meantime, many of these children have had to face their immigration proceedings without their parents in court. NPR's Sasha Ingber pointed out one incident in which a 1-year-old boy was brought before a judge. "[Judge] John W. Richardson ... said he was 'embarrassed to ask' if the defendant understood the proceedings," Sasha reported. And activists, for their part, have described a "bureaucratic wall" that has prevented detained parents from finding and contacting their children. "The systems that are in place are absolutely not equipped to deal with this," Emily Kephart of the nonprofit Kids in Need of Defense told NPR's Nurith Aizenman last month. Still, despite the frustrations and delays, Sabraw sounded a positive note, suggesting that he would be inclined to extend the July 10 deadline given the work that Fabian presented Monday. "This is real progress, I'm optimistic that many of these families will be reunited tomorrow," he told the courtroom. "And then we'll have a very clear understanding as to who has not been reunited, why not and what time frame will be in place."